Many hundreds of different nationalities and ages including over 20 Ambassadors of different countries participated in a “Gandhi March” in The Hague, the seat of the Dutch Government, on Sunday, September 30, 2018 to mark the upcoming International Day of Non-Violence. The event was also a precursor to the commencement of celebrations of the 150th birth anniversary of Mahatma Gandhi set to be launched by the Government of India on October 2 in India and abroad. The marchers for non-violence gathered at the iconic Peace Palace – home to the International Court of Justice and the Permanent Court of Arbitration. The Netherlands Association of Malayalees (Nanma) entertained the gathering with the Chenda Melam (drums of Kerala) and Onam dancers as people gathered. Ambassador of India to the Netherlands, H.E. Mr. Venu Rajamony welcomed the gathering, followed by brief speeches by spiritual guru from India Sri M, and Deputy Mayor of The Hague Ms. Kavita Parbhudayal. The rally was led by Ambassadors of the USA, Indonesia, Canada, Ireland, Bangladesh, Sri Lanka, Belgium, Romania, Palestine, Cyprus, Italy, Afghanistan, Guatemela, Rwanda, Bosnia & Herzergovina and of course the ambassador of the organizing country, Mr. Venu Rajamony. Participants wore T shirts specially designed for the occasion with the logo ‘Follow the Mahatma’ and a picture of Gandhiji. They also carried posters and shouted slogans advocating non-violence and peace as well as the teachings of Mahatma Gandhi. The colourful march traversed through the City of the Hague and the participants congregated at the historic Grote Kerk or Big Church of The Hague. The Ambassadors of US, Indonesia and Afghanistan addressed the marchers at the Grote Kerk. Multinational cultural performances highlighting the message of non-violence were held along with a special exhibition mounted on a Khadi Scroll (curated by Pramod Kapoor of Roli Books, India). 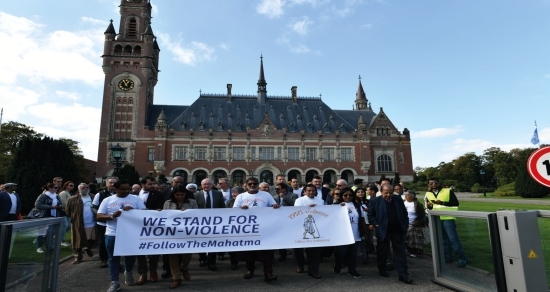 The ‘Follow the Mahatma’ campaign was launched by organisations and individuals advocating Non-Violence in the Netherlands, the Indian community and the Embassy of India in 2017 with the aim of reiterating to the world community the importance of Non-Violence and peace. The Embassy of India along with these community organizations conducted during the period of October 1-5, 2018 an education outreach programme under which over 100 volunteers would fan out to around 20 schools of the Netherlands to spread the message of non-violence and to educate students about the life of Mahatma Gandhi and on how India won freedom through a non-violence movement. A social media campaign with the hashtag #followthemahatma also conducted during the period inviting people across the Netherlands to post messages reiterating their commitment to the principle of non-violence. Above activities were to be followed up with six events in four cities on October 2 which marked the formal commencement of the [email protected] celebrations. The march was sponsored by City of The Hague Municipality, Tata Steel, Zeelandia, HCL, POSC and Gravin van Bylandt Stichting. [email protected] celebrations were launched on October 2 in the Netherlands with six events in four cities of The Hague, Amsterdam, Utrecht and Zoetermeer Six events in four cities marked the launch of the two-year long celebrations of the 150th birth anniversary of Mahatma Gandhi in the Netherlands. Gandhi statues in the four cities of The Hague, Amsterdam, Utrecht and Zoetermeer were garlanded and the public invited to place flowers at the feet of the statue as a mark of respect amidst speeches, singing of favorite songs of Mahatma Gandhi and cultural programs on October 2, the birth anniversary of Mahatma Gandhi and the International Day of Non-Violence. Special commemorative stamps marking the 150th birth anniversary issued by the Indian Postal Department were presented by Ambassador of India to the Netherlands, H.E. Mr. Venu Rajamony to the former Foreign Minister and Chairman of Carnegie Foundation, Dr. Bernard R. Bot and Director General Erik de Baedts at a function in front of the iconic Peace Palace, home to the International Court of Justice and the Permanent Court of Arbitration. A LED projection on the “Relevance of Bapu’s message in the contemporary world” was further being organized at a special function in honour of Mahatma Gandhi within the Peace Palace as well as at public places like the Railway Stations of the four large cities of The Hague, Amsterdam, Rotterdam, and Utrecht.